Acoustic Energy resurrects AE109, launches new AE100 model | What Hi-Fi? The AE109 was first launched in 1996, but now it's back to celebrate Acoustic Energy's new British ownership. Acoustic Energy is back under British ownership - not only that, it's celebrating its 30th anniversary this year. How better to celebrate than to bring back one of its most iconic speakers? The original AE109 launched in 1996, and was praised for its great performance and high build quality. 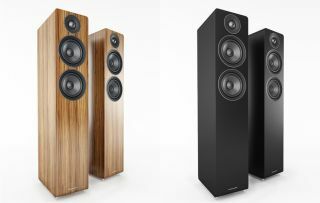 Over 20 years later, Acoustic Energy has announced the new AE109 floorstander, the flagship of the new 100 Series. And it looks every inch as good as its predecessor. So what's new? It features Acoustic Energy's WDT waveguide tech, as seen in its recent AE1 Active. An evolution of the DXT lens, it reshapes the high frequency sound-wave to improve imaging and provide a wider listening zone, making the sound more room-filling. Slot ports in the back reduce mid-range colouration and improve bass response, while mass-loading material in the base improves cabinet damping and bass control. It has a new look too, with a slimline appearance and smaller footprint. Acoustic Energy has also launched a brand new speaker, the AE100. It's a bookshelf/standmount number, designed to give high sound pressure levels from a small package. Inside is a 110mm driver, built around an ultra high-force motor system allowing for an extremely long throw under control. A slot-shaped bass duct port provides enough cross-sectional area to stop the air becoming audible as it moves through the duct. Plus there's a 28mm soft dome tweeter with Wide Dispersion Technology. Both speakers are available this month. Prices range from £199 for the AE100 in walnut vinyl veneer to £549 for the AE109 in satin black. They will be joined this summer by the AE107 centre speaker and AE108 subwoofer, making a full 5.1 set-up.